Technicians have just installed the ninth of 18 primary flight mirrors onto the mirror holding backplane structure at the agency’s Goddard Space Flight Center in Greenbelt, Maryland. The team is using a robotic arm to carefully but diligently attach each mirror to the structure of the gargantuan observatory that will eventually become the most powerful telescope ever sent to space – exceeding Hubble! 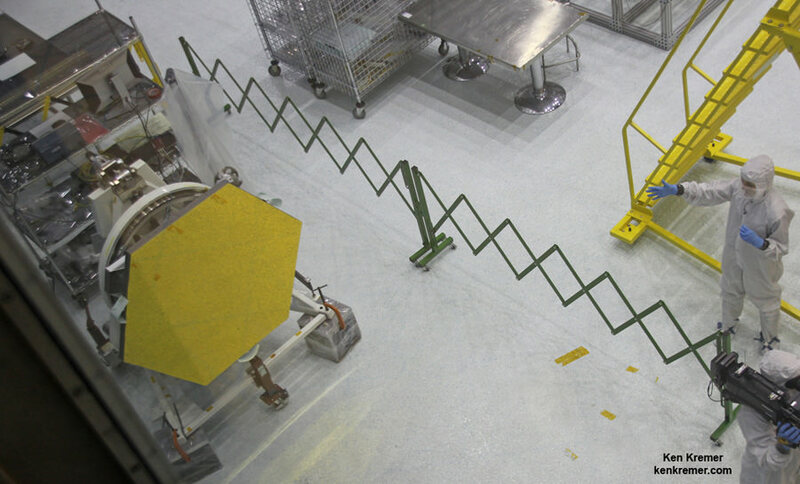 “This fall we started installing every mirror,” said Sandra Irish, JWST lead structural engineer during a recent interview with Universe Today at the NASA Goddard clean room facility. The painstaking assembly work to piece the mirrors together began when the first unit was successfully installed onto the central segment just before the Thanksgiving 2015 holiday. Working inside the massive clean room at NASA Goddard dedicated to the task, the engineering team manipulates the huge robotic arm to precisely lift and lower each gold coated mirror into place onto the observatory’s critical mirror holding backplane assembly. “We are in good shape with the James Webb Space Telescope,” said Dr. John Mather, NASA’s Nobel Prize Winning scientist, in a recent exclusive interview with Universe Today at NASA Goddard. The actual flight mirror backplane is comprised of three segments – the main central segment and a pair of outer wing-like segments holding three mirrors each. One by one the team has first been populating the 12 unit central segment of the telescope structure with the primary mirrors at a pace of roughly two per week since the installations started some five weeks ago. The mirrors are currently covered with a black colored cover to protect them from optical contamination during the installation process. The pair of foldable side mounted wings at both sides, each holding a trio of mirrors, remain empty as of now. The wings have been unfolded from the stowed-for-launch configuration to the “deployed” configuration to carry out the mirror installation. They will be folded back over into launch configuration for eventual placement inside the payload fairing of the Ariane V ECA booster rocket that will launch JWST three years from now. Each of the 18 hexagonal-shaped primary mirror segments measures just over 4.2 feet (1.3 meters) across and weighs approximately 88 pounds (40 kilograms). In space, the individual mirrors will unfold into several sections and work together as one large 21.3-foot (6.5-meter) mirror, unprecedented in size and light gathering capability. To complete the entire mirror installation process onto the backplane assembly will take several months and continue into early 2016, Irish told Universe Today. 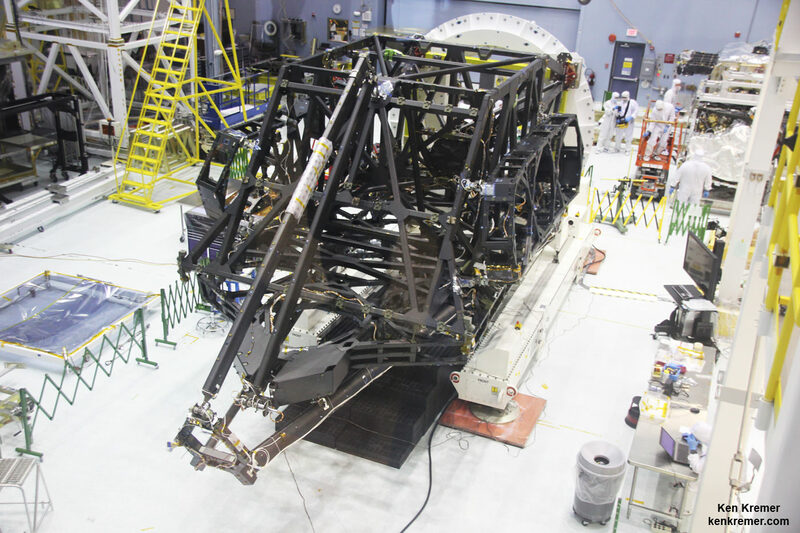 The telescopes primary and secondary flight mirrors had previously arrived at Goddard and the teams had practiced the installation using flight spares and engineering units. “The years of planning and practicing is really paying dividends and the progress is really rewarding for everyone to see,” said NASA’s Optical Telescope Element Manager Lee Feinberg, in a statement. “Then next April 2016 we will install the ISIM science module inside the backplane structure,” Irish elaborated. 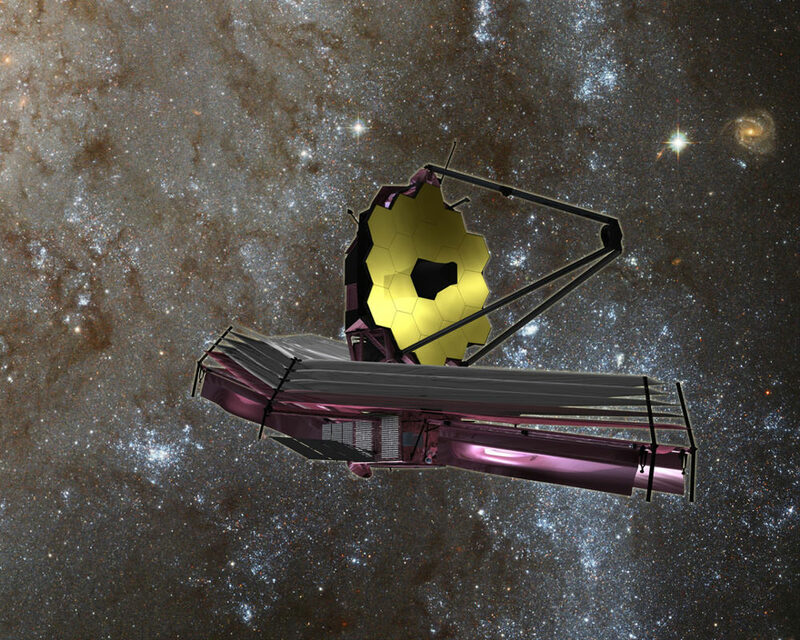 JWST is the successor to NASA’s 25 year old Hubble Space Telescope. “James Webb has a much bigger mirror than Hubble. So its resolution is much better,” said astronaut and NASA science chief John Grunsfeld, during an exclusive interview with Universe Today at NASA Goddard. Grunsfeld flew on a trio of Hubble servicing missions aboard the Space Shuttle, including the final one during STS-125 in 2009. So its 9 down and 9 mirrors to go! Watch for more on JWST construction and mirror installation. I hope this works. This is a very complex system, and there are many stages where things could go wrong. It will be very difficult to reach if there is a problem. Actually, know. Hubble was designed as serviceable from the beginning, including upgrading the instrument which was done several times. After the final mirror is installed will the assembled OTA be tested for alignment and focus? What will happen to the ‘flight spare’ he asks as he visualizes an amateur built off-axis folded OTA… What is the focal length of this mirror? You are off by about a decimal place on both telescopes. They’re only now trying to build a 30 meter telescope oN THE GROUND. Focal length, they are reflectors. Well, then, I stand corrected. Thanks, Ken, for another terrific piece. I don’t think I appreciated the size of this critter. I notice in the early photos a large superstructure captioned as part of the backplane, but in the final illustration it’s nowhere to be found. Perhaps this is simply holding the scope in place during launch and jettisoned? Next PostNext How Strong is Gravity on Other Planets?